This slot game from Novomatic is a classic, vintage-style slot game with five reels and plenty of paylines. 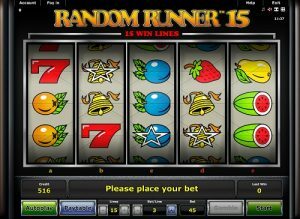 If you’re a fan of fruity slots that take you back to times gone by when slot games were simple and lucrative, then Random Runner 15 is the game for you. If you used to be one of those people who used to play in games arcades and who loved the old-school land-based slot machines then you’ll definitely enjoy spinning these reels! What’s more, fans of other simple, fruity, vintage-inspired slot games from Novomatic, such as: Random Runner, Power Joker and Spinning Fruits, are going to love this one. This slot is like having three slots in one and it has all of the classic sound effects and music that add to making a slot feel like it’s actually real and not just an over-complicated video game! You’ll hear the reels clicking into place and you’ll hear that bell ring when you get a big win! The slot machine was first invented well over 200 years ago and the symbols on, not the first slot machine, but on the few slot machines that closely followed it, have stuck around and continue to show up on the reels of many modern slot machines! These symbols include fruits, sevens and stars, all of which are present on the reels of Random Runner 15. There’s nothing better than hearing those reels lock into place and watching matching fruits or stars or sevens give you a win! All of the symbols in Random Runner 15 pay from three or more matching symbols and payouts amounts will vary according to your bet which, as usual, you can adjust to suit your gaming needs and preferences! The fruit symbols in Random Runner 15 slot game are: the oranges, the lemons, the plums, the strawberries, the grapes and the melons! There are also the golden bells, the red sevens and the stars! Random Runner 15 slot game is like three slot games in one. There are three different three-reel, five-payline slot games which overlap each other on the overall five reels. This gives you increased chances at getting wins as the reels all spin together as if they’re one slot machine but you get payouts when matching symbols fall on consecutive reels (on a payline) pretty much anywhere, from the first reel, second reel or third reel and going from left to right. There is also an extra special feature (which you may have seen on another slot if you’re a massive Novomatic slots fan) which is the transparent star. When any of the symbols have one these white-outlined transparent stars on them, it means that they’re a Wild symbol so when you spin three of these symbols with the stars on (even if they’re not the same symbol) you’ll get a payout as if they are! Like you can all other Novomatic slot games, you can play Random Runner 15 for free here at NovomaticCasino.co.uk, as we love all things Novomatic, and we can also tell you the best places where you can play Novomatic slots for real money! Random Runner 15 can be put into autoplay mode which means that, for busy gamers, you can benefit from being able to play and win hands-free and without so much as lifting your little finger! In autoplay mode, though, just be aware that you won’t be able to adjust your bet unless you stop this feature. Once you do, and you change your bet, then you can enable it again and play hands-free! If you enjoy playing this game, why not check out Novomatic’s best slots, like: Book of Ra Deluxe and Ultra Hot Deluxe? These are some of the most popular and most-played games of any online casino as they’re absolute gems from Novomatic which are entertaining and lucrative, too!